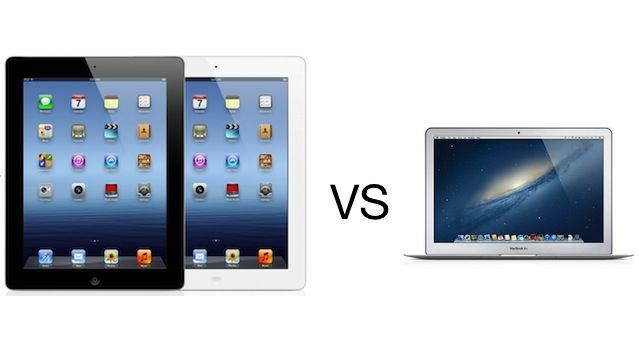 Which is better for college, An iPad or MacBook Air? You’re going to college. That means huge lists of all the crap you need to start school of right. Not just books, furniture, clothing, mini-beer refrigerators, and all that junk, but also backpacks and probably some tech gear to get you through the semester. For most people, the MacBook Air is the best laptop on the market. But if you’re going to college, you might not even need a laptop anymore. We think a lot of college students can get by and just buy an iPad instead of a MacBook Air. Here’s why. People think that the iPad is only fit for consuming media, but that’s not true at all. Most college homework assignments can be done on an iPad. Ok, so maybe you’re balking at the suggestion that you could get everything done on an iPad that you would need to do on a MacBook Air, but think about it. What do you really need to do on a MacBook that you can’t do on an iPad? Make videos? There’s iMovie for iOS. Listen to copious amounts of music? Try Rdio or Spotify. Video games? There’s Infinity Blade, Fifa ’12, DeadSpace, Modern Combat 3, and 1000’s of other cheap titles on the App Store. Photography? Upload your pictures with the camera connection kit, edit them in Snapseed and upload them to Facebook, Flickr, Instagram, or wherever you want. People think that the iPad is only fit for consuming media, but that’s not true at all. Most of your college homework assignments can be done on an iPad, and most of the time, it’s more fun to do them on an iPad. Unless you’re a Computer Science major who needs to program in C++, Visual Basic, XCode, and Java, then you can probably get all your homework done on an iPad. You can check your email, write essays in Pages, create PowerPoints, record videos, print documents, make music, procrastinate by playing Kingdom Rush for hours, listen to new music, and watch movies, and Skype with your mommy all on your iPad. Just make sure to buy the Apple Bluetooth Keyboard to write your essays with, because no one wants to type a 2000 word essay on a virtual keyboard. One of the added benefits of buying an iPad instead of a MacBook Air is that if you buy or rent digital textbooks, your iPad will more than pay for itself. Seriously. eTextbooks are significantly cheaper than their regular dead paper brothern. Even if only half of your textbooks available as eTextbooks there’s a good chance you’ll save more than $500 over your 4 year stay at college. An added bonus with buying an iPad and eTextbooks is you’ll have a lot less weight to carry around in your backpack. If you’re investing in the iPad you’ll be carrying less crap in your bag which means less weight, less stress and a happier you. Speaking of carrying less weight, the iPad is nearly 1lbs lighter than the 11-inch MacBook Air and 1.5lbs lighter than the 13-inch MacBook Air. Imagine waking up five minutes before class starts, rolling out of bed, and being able to just grab your iPad and bluetooth keyboard and running to class. Anytime you need to go somewhere you can just grab your iPad and all of your homework, notes, and textbooks are right there with you so you can get a little bit of homework done while you’re waiting for your hamburger at Five Guys. If you’re investing in the iPad you’ll be carrying less crap in your bag which means less weight, less stress and a happier you. You might not even need a backpack because your textbooks will be on your iPad, along with your notes and assignments. When you think about everything an iPad can do compared to a MacBook Air, it hits you that $499 is crazy cheap. It’s worth it. And as a college student who will probably need to save all the pennies you can to afford nicer things like food, or wild weekend trips to Mexico, you’ll need that extra cash. The baseline MacBook Air model costs $999, and most computer owners upgrade their machine every two years. You’ll probably want to upgrade your iPad every two years too. That means you’ll only spend $1000 on iPads instead of $2000 on MacBooks while you’re at college. I loved my MacBook Air. It was thin, and tiny, and always down for a good time. The biggest problem with it though, was its battery life kind of sucked. Apple claims the 11-inch MacBook Air has a 5 hour battery life, but my experience was that it’s closer to 2.5 hours when you’re surfing the internet, writing, and listening to music – you know, actually using your computer. The iPad on the other hand has a freaking amazing battery. It’s ready to party all day long and you won’t have to carry around the charging cable. More often than not, I would sit through classes with my MacBook just praying that my battery would make it through the entire class. With the iPad, a full charge will get you through all of your classes, allow you to play games during lunch, and still have a ton of juice left over at night. It takes longer to charge than a MacBook Air, but you can just plug it in when you go to bed and it will be full before you wake up in the morning. Maybe colleges have improved since I was on campus, but free campus Wi-fi can be spotty at times, which is a big pain if you’re trying to get some homework done and upload it to Blackboard, or send a professor an email, or say hi to that hot girl from BIO 183 on Facebook. The MacBook Air doesn’t have a 4G antenna built in, so you’re at the whims of your university’s infrastructure. If you’re in class and the wi-fi is down, too bad. No grade for you! But if you have an iPad with 4G data, you’ll be able to connect to the internet whenever you need to (as long as someone keeps paying your bill). The multi-tasking limitations of the iPad might help you stay focused and keep your grades up. Here’s one area where you might not have thought that the iPad will help you. iOS still isn’t great at multitasking. You can’t switch between apps quickly so it makes it really hard to do multiple things at once. That’s actually an asset when you’re in college where you’re supposed to be learning and actually paying attention to what professors say. If you’re taking notes on your MacBook Air, you’re probably going to get bored and CMD+Tab over to Chrome and open up Facebook, or get lost on Buzzfeed for hours. But if you’re taking notes on an iPad + Apple Bluetooth Leyboard, there’s none of that. If you want to pay attention and get the notes you need, you better keep that notes app open or you’ll probably miss out. A lot of people are going to slack off in class no matter what device they buy, but some students just need a little less temptation peeking through their computer screen to help them concentrate in class. If you think you’re one of them, then the multi-tasking limitations of the iPad might help you stay focused and keep your grades up. Replacing a laptop with a tablet isn’t a new or radical idea, but it still hasn’t really caught on yet in a major way because there are some drawbacks. You can finally print from an iPad, but only on certain printers. Your college probably doesn’t have them, so you’ll either have to upload assignments to Dropbox and print them out in the computer lab, or print them from your printer at home. File transfers still aren’t great on iPad. iOS 6 will let you upload files from the Safari browser, which is a much needed feature, but you don’t have access to the file system of an iPad, and will have to jump through a few extra hoops of placing your files in Dropbox or iCloud and then moving them where they need to go. Storage on the iPad is fairly limited, and buying the higher end models with more storage will make you spend almost as much as you would on a MacBook Air. If you want to buy an iPad instead of a MacBook Air you’ll need to learn all about cloud storage solutions like iCloud, DropBox and Google Drive, and figure out the best ways to implement them. Let’s be honest, unless your major is Computer Science or Nanobot Engineering or something like that, the you’re really not going to be doing that many crazy things with your computer. The iPad isn’t the perfect machine for every student, but it can handle the course work for most college students, and in the rare case that it can’t, your school has a computer lab. The iPad is strong enough for university tasks, it’s more portable, has a better, battery, and is always connected to the internet, which is everything you could ask for if you want to succeed in college.